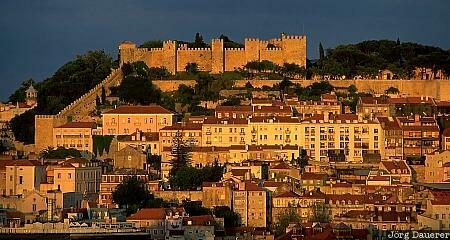 The Castelo de Sao Jorge towering over Lisbon illuminated by warm evening light. Lisbon is the capital of Portugal. This photo was taken from the Miradouro Sao Pedro de Alcantara in Barrio Alto at the afternoon of a cloudy day in May of 2000.